Free Printable Valentine Trivia Game. Free Printable Valentine Trivia Game for your Valentine’s Day party. Great free printable trivia game to entertain your guests at the Valentine’s Day Party or Bridal Shower in February. Let’s find out how much you know about Valentine’s Day, romance, love, kissing, chocolate, greeting cards, flowers, god of love, love quotes and more. The participant with most correct answers wins. The game includes 12 interesting Valentine related facts and the answers sheet on page 2. 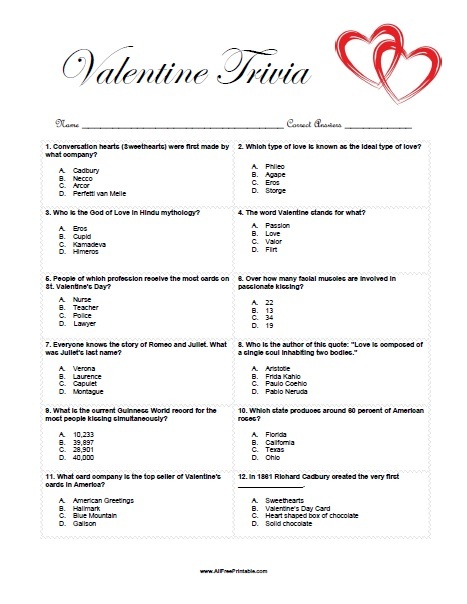 Click the link below to download or print the Valentine Trivia quiz Game now in PDF format. Happy Valentine’s Day!